Since the service sector is the biggest contributor to the U.K.’s GDP, you can bet your neighbor’s cat that market players around the world will be tuning in for their latest employment figures. The release has two main components: the claimant count change and the unemployment rate. The former shows the number of folks who claimed unemployment-related benefits for the month, so a lower figure is generally good for the economy. The latter measures the percentage of the labor force that is unemployed and actively looking for work so a declining trend usually indicates an improving labor situation. Since the policymakers over at the Bank of England (BOE) are monitoring wage growth closely, the average earnings index also tends to catch investor attention. This is the three-month rolling average of the change in salaries, making it a leading indicator of consumer inflation and spending. As you can see from the chart below, the actual releases tend to print better than market estimates. Just last month, the unemployment rate came in at 4.9%, its lowest level in more than a decade. Jobless claims also increased by 400, though the previous month’s figures were revised higher. Last but not least, average hourly earnings rose by 2.3% against the earlier 2.0% increase. The British pound ended up rising across the board, with GBP/USD gaining about 100 pips in the first hour of the release. More importantly, the pound managed to keep its gains against its major counterparts until the end of the day. What’s expected for the upcoming release? July’s claimant count change reading, which is expected to show a 5.2K increase in unemployment, would mark the first glimpse of the jobs situation ever since the EU referendum. Remember that the BOE was worried that a Brexit vote would put a dent on business sentiment, enough to influence hiring patterns in the labor market. As for the unemployment rate and average hourly earnings, these are still June figures so they might not make such a strong impact on pound pairs. The unemployment rate is expected to remain at 4.9% while average hourly earnings is expected to grow by 2.5% from May’s 2.3% growth. GBP pairs tend to consolidate ahead of the release. 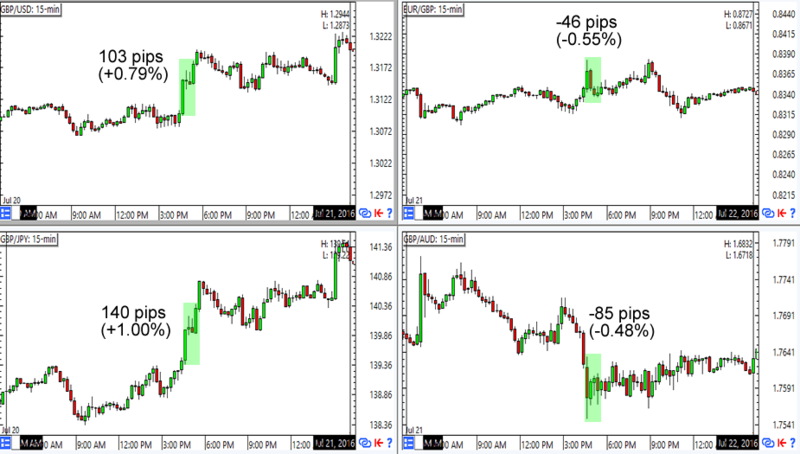 Unless there are major price drivers in the Asian session, expect to see tight trading ranges. Price reaction is clearest up to an hour after the release though momentum can still extend to the U.S. session if the actual figures vary significantly from market expectations. Consider a “sell-the-rumor-buy-the-news” scenario. Traders have been shorting GBP in anticipation of weak U.K. report releases. Unless the reports make a convincing case for more BOE stimulus, we’ll likely see relief rallies for the pound. There you have it, folks! If news trading ain’t your cup o’ tea, then you can always sit on the sidelines during the event. Just make sure you stay updated on how the numbers turn out so you can make the necessary adjustments to your biases!